Knee osteoarthritis (OA) is becoming more prevalent worldwide due to increases in the numbers of elderly and obese patients. Currently, pharmaceutical medicines used for the treatment of OA are for symptomatic therapy and therefore new therapeutic agents are needed. 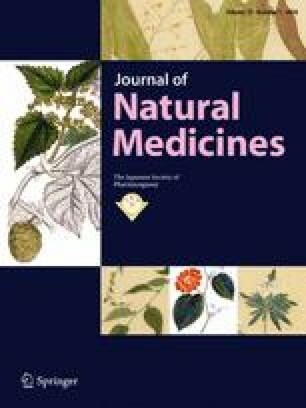 Kaempferia parviflora (KP) is a plant growing naturally in Southeast Asia and has various pharmacological effects including an anti-inflammatory effect, but no effect on OA has yet been reported. We therefore conducted a search for the effects KP and the active components of KP extract (KPE) exert on OA as well as its mechanism of action. Results from a study of KPE using the monoiodoacetic acid rat OA model revealed that KPE reduced the pain threshold and severity of osteoarthritic cartilage lesions. The mechanism of action and active components were then investigated using IL-1β-treated human knee-derived chondrocytes. KPE, as well as 5,7-dimethoxyflavone and 5,7,4′-trimethoxyflavone, which are key constituents of KPE and highly absorbable into the body, reduced the expression of matrix metalloproteinases (MMPs), which are the main extracellular matrix enzymes that degrade collagen within cartilage. As mentioned above, KPE acted to suppress OA and 5,7-dimethoxyflavone and 5,7,4′-trimethoxyflavone were shown to be involved as part of KPE’s mechanism that inhibits MMPs.